Noise can be a big problem, especially if you live near railway lines, by busy roads, or next to a prime spot for seagull mating! 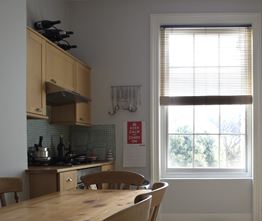 By sound proofing and draught proofing your sash windows with acoustic glass, we can help you to reduce external noise and have a more restful, stress-free experience in your home. For simple noise reduction, we’d recommend acoustic glass (single glazed, acoustic, laminated panes). For noise reduction and reduced heat loss, we’d recommend draught proofing, and double glazed, acoustic, laminated panes. For extreme noise on flight paths or busy roads, we’d recommend secondary glazing, which will require a gap of 100 – 150mm. This means you can keep your existing or original sashes, which is good for the environment and your pocket, as it is often more cost-effective that double or acoustic glazing. For listed buildings, and when you are unable to replace the glass in your windows, we’d recommend draught proofing or secondary glazing as a great noise reduction alternative.